A desmodromic valve is a reciprocating engine valve that is positively closed by a cam and leverage system, rather than by a more conventional spring. "The specific purpose of the desmodromic system is to force the valves to comply with the timing diagram as consistently as possible. In this way, any lost energy is negligible, the performance curves are more uniform and dependability is better." In modern engines, valve spring failure at high RPM has been mostly remedied. The main benefit of the desmodromic system is the prevention of valve float at high rpm. It has the primary disadvantages of complexity, since there are more components, and lack of understanding, which prevents people from straying from the well-known conventional valvetrain with its valve springs. In traditional sprung-valve actuation, as engine speed increases, the momentum of the valve will eventually overcome the spring's ability to close it completely before the piston reaches TDC (Top Dead Centre). This can lead to several problems. First, and most damaging, the piston collides with the valve and both are destroyed. Second, the valve does not completely return to its seat before combustion begins. This allows combustion gases to escape prematurely, leading to a reduction in cylinder pressure which causes a major decrease in engine performance. This can also overheat the valve, possibly warping it and leading to catastrophic failure. In sprung-valve engines the traditional remedy for valve float is to stiffen the springs. This increases the seat pressure of the valve (the static pressure that holds the valve closed). This is beneficial at higher engine speeds because of a reduction in the aforementioned valve float. The drawback is that the engine has to work harder to open the valve at all engine speeds. The higher spring pressure causes greater friction (hence temperature and wear) in the valvetrain. The desmodromic system avoids this problem, because it does not have to overcome the static energy of the spring. It must work against the momentum of the valve opening and closing, and that force still depends on the effective mass of the moving parts. The effective mass of a traditional valve with spring includes one-half of the valve spring mass and all of the valve spring retainer mass. However, a desmodromic system must deal with the moment-of-inertia of the two rocker arms per valve, so this advantage depends greatly on the skill of the designer. 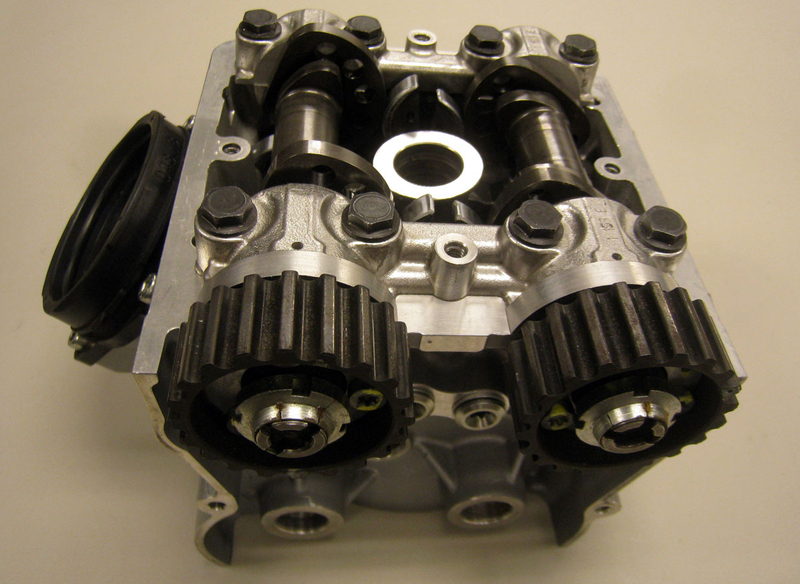 Another disadvantage is the contact point between the cams and rocker arms. It is relatively easy to use roller tappets in conventional valvetrains, although it does add considerable moving mass. In a desmodromic system the roller would be needed at one end of the rocker arm, which would greatly increase its moment-of-inertia and negate its "effective mass" advantage. Thus, desmo systems have generally needed to deal with sliding friction between the cam and rocker arm and therefore may have greater wear. 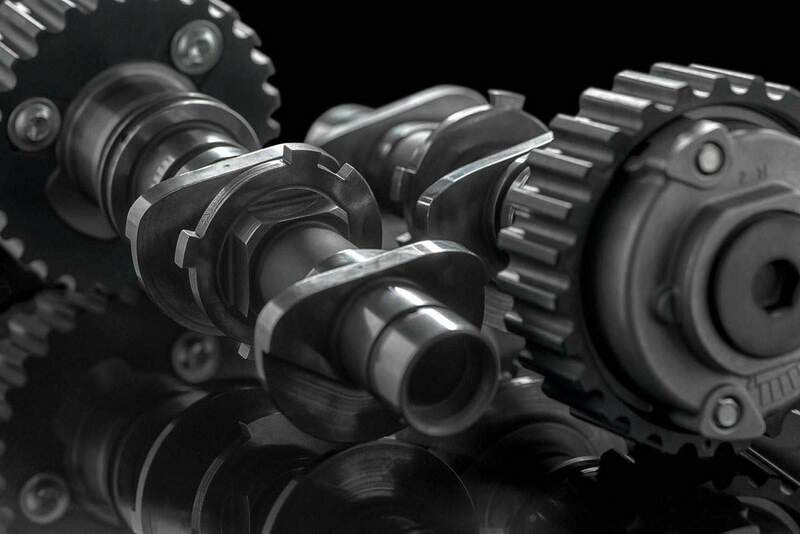 The contact points on most Ducati rocker arms are hard-chromed to reduce this wear. 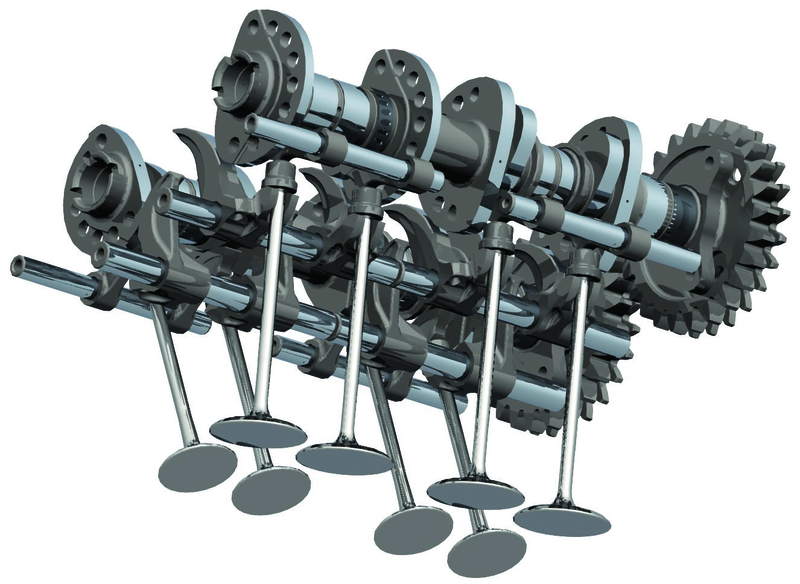 Another possible disadvantage is that it would be very difficult to incorporate hydraulic valve lash adjusters in a desmodromic system, so the valves must be periodically adjusted. However the desmodromic system is not ideal in a practical world of mechanics, but it still survives and performs without problem. While it can be more expensive to maintain than traditional spring-actuated valve systems, many aftermarket precision machined components can extend the maintenance interval to that of spring actuated systems (in comparable motorcycles). While newer, high-performance pneumatic systems may follow more specific design and engineering specifications (computer-aided) they are typically limited to racing applications (Formula 1, Moto GP, etc.). Currently, there is no method of determining longevity or extended maintenance intervals of such systems in practical, everyday, systems such as the automobile.